Giving the wearer the best chance of survival during an emergency situation, the Intrepid Mk1 Immersion Suit is one of the world's premier insulated suits. 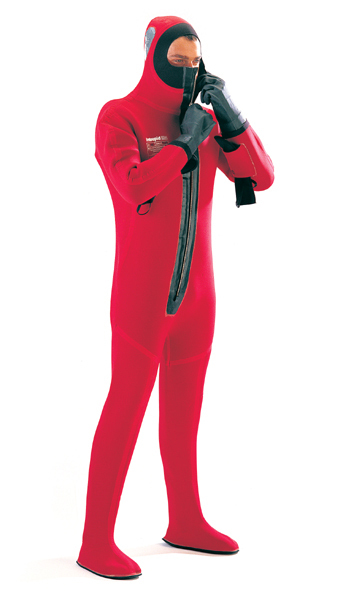 The Intrepid Mk1 Immersion Suit has been manufactured from 4-way stretch 5mm neoprene. This gives the user maximum freedom of both movement and vision during a critical emergency and also giving a level of fire resistance and excellent thermal insulation. The amount of unwanted air trapped in the lower part of the suit is minimised by the close fitting design of the Intrepid Mk1 Immersion Suit. Donning - The large offset zip makes the Mk 1 quick donning, the integral 5 finger gloves allow full dexterity during and after donning. Hand Protection - For in water use an additional pair of thermal mitts are housed in easily accessible pockets situated on the sleeves. Feet - The feet are protected by non-slip rubber soles which give both grip and protection. Neoprene Hood - The hood is fitted with an effective face seal and has 150sq cm of retro reflective tape to aid survivor location.